Minister of State to Northern Ireland, John Penrose MP, tells David Whelan that the “degree of fatalism” being felt by business and civil society in regards to talks to restore Stormont should “give us all pause for thought”. Just over four months since accepting a request by Prime Minister Theresa May to undertake the job of Minister of State in the Northern Ireland Office, Penrose admits that he continues to read himself into the role, declaring that failure to do so would be a “huge mistake”. “Part of it [the job] is ensuring you read yourself in as thoroughly as possible, particularly in a place like Northern Ireland, where some of the problems are so long-standing, so difficult, so sensitive and delicate,” says the Conservative representative for Weston-super-Mare. Penrose outlines that much of his work to date has included engagements with the likes of business and local community groups to gather a better appreciation of their take on things like the “closely fought, really important” words of the Belfast Agreement. Engagement with Northern Ireland’s political parties has also been a focus, something Penrose describes as an “ongoing process”. Over two years on from the collapse of Stormont, the MP confirms that a negotiated return to power sharing remains the avenue which the Northern Ireland Office (NIO) continues to pursue. This approach appears to be built on the proximity to an agreement to end the stalemate in February 2018, before the deal broke down. Stating that those negotiations “came very close”, Penrose, who was not part of the NIO team involved, believes that the event signalled progress. “It hasn’t worked but I think it would be wrong to point to it and say there has been no progress here,” he says. Speaking just days prior to the announcement by Secretary of State Karen Bradley of the introduction of secondary legislation under the Northern Ireland (Executive Formation and Exercise of Functions) Act 2018, extending the period for devolved government to be restored by a further five months, Penrose suggests such a move will “create space and opportunity for talks to bear fruit”. However, he believes there is also a “human piece” to be done in terms of getting people into the process, which involves a greater understanding of the purpose of talks to get past “redlines” and “pre-conditions”. Asked whether he believes the NIO has done enough to break the deadlock, he says that the answer is both yes and no. He highlights “regular and periodic” efforts by the office but says the lack of a resolution would indicate the need to “keep trying”. Penrose does not accept suggestions that the confidence and supply pact between his Conservative Party and the DUP has impeded the Secretary of State’s role in overseeing the talks, however, he suggests that the evidence that this is not the case needs to be demonstrated. Outlining the need for a “show not tell” approach, Penrose suggests that overseeing the talks would be a much more difficult task if the relationship was a “full blown coalition”, rather than the existing “limited partnership”. “We will have to ensure that everyone understands that and [we] need to demonstrate good faith on all sides, ensuring that you are trying to be as even handed as you can be,” he explains. 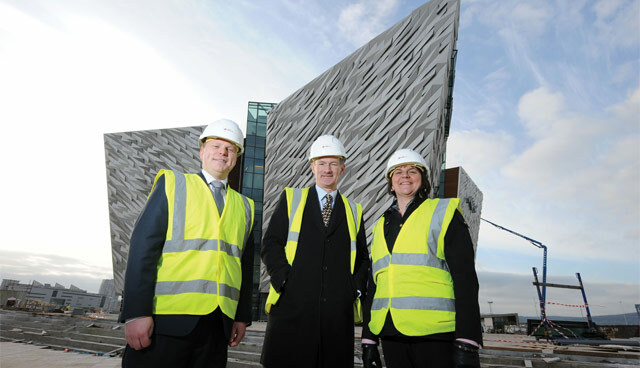 Then Assembly Private Secretary, DETI, Alastair Ross; UK Minister for Tourism and Heritage John Penrose MP; and Tourism Minister Arlene Foster visiting Titanic Belfast ahead of its opening in March 2012. Entering politics later than most of his contemporaries, Penrose explains that the switch from a successful business career into politics in 2005 was born out of frustration and a desire to effect change. Coming through state-funded education, the son of two teachers, held a number of private sector roles after university with the likes of J P Morgan, McKinsey, Thompson Educational Publishing and Pearson PLC. His political career has seen him serve as Parliamentary Private Secretary to Oliver Letwin MP; Shadow Business Minister; Tourism and Heritage Minister; Government Whip; and Constitution Minister. He is currently the Prime Minister’s Anti-Corruption Champion and Chair of the All-Party Parliamentary Group on Housing and Planning. 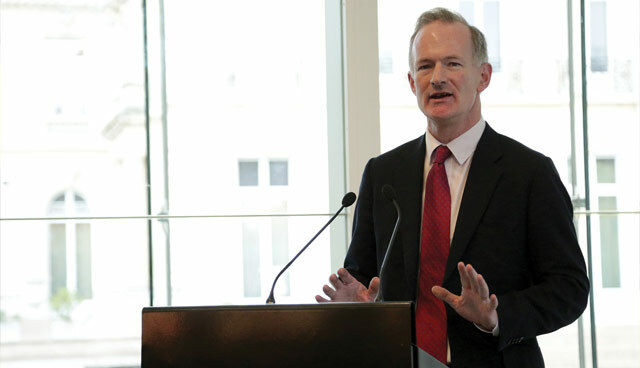 His “modest” links to Northern Ireland lie in his time as Tourism and Heritage Minister, when he visited Titanic Belfast in 2012 prior to its opening. However, it was Brexit rather than boats that occupied Penrose’s thoughts when offered the role. Coming just hours after the publishing of the draft withdrawal agreement negotiated between Theresa May and the EU, Penrose admits that he delayed taking the offer immediately, instead seeking permission to finish reading the agreement’s full text. This, he explains, was to ensure that there was nothing within the text that he couldn’t agree with on principle. Penrose believes that it was “inevitable” that Brexit would factor into his decision, given the proximity of the agreement to his being offered the post but outlines that it was not the sole factor, believing that the “challenges and opportunities” in Northern Ireland are “extraordinary”. Quizzed on whether Brexit-dominated business in Westminster has diminished the focus of the NIO on restoring power sharing, Penrose believes the two issues overlap. Acknowledging that the Brexit process will have differing impacts on Northern Ireland’s political parties and their willingness to be involved in restoration talks, he also points to “externalities”, such as the impending RHI report, to have an impact but states that these factors must not be an “excuse” for “kicking the can down to road”. Although acknowledging the complexities of Brexit for Northern Ireland, the Minister of State recently made headlines when he described a no deal warning by Northern Ireland’s most senior civil servant as “politically charged” during Northern Ireland questions in the Commons. Asked as to whether he thought the tone of David Sterling’s letter reflected the level of concern among officials in Northern Ireland, Penrose explains that his comments were a reflection of feedback from different parties in Westminster. Penrose was in Northern Ireland on the same day that Secretary of State Karen Bradley had travelled to Belfast to apologise to the families of Trouble’s victims following her remarks that deaths caused by security forces in Northern Ireland were “not crimes”. Legacy stakeholder management is a key responsibility of the NIO and Penrose says that the office is moving forward and dealing with addressing the legacy of Northern Ireland’s troubled past. The MP states that the office are still working through the some 17,000 responses received in relation to the ‘Addressing the Legacy of Northern Ireland’s Past’ consultation document. “We make sure to treat those submissions with proper care and consideration and then we will need to lay out what the Stormont House Agreement said four years ago and how we can now take these things together and come up with something that everyone can live with,” he says.